Nine years ago on October 27th (2009), I recommitted my life to God. I was born again into the arms of my Savior, Jesus Christ. Baptized a day later in holy waters at a ministry in Georgia I had spent 10 years saying ‘no’ to, I came out anew. Before then, I’d gone so far away from the relationship I’d had with Jesus as young girl, it was virtually wiped from my memory. However, God didn’t forget. Today, as I do every year, I am toasting God for reaching into my heart and pulling me back into the Kingdom; leading me to relinquish “self” for a life I didn’t know was possible. 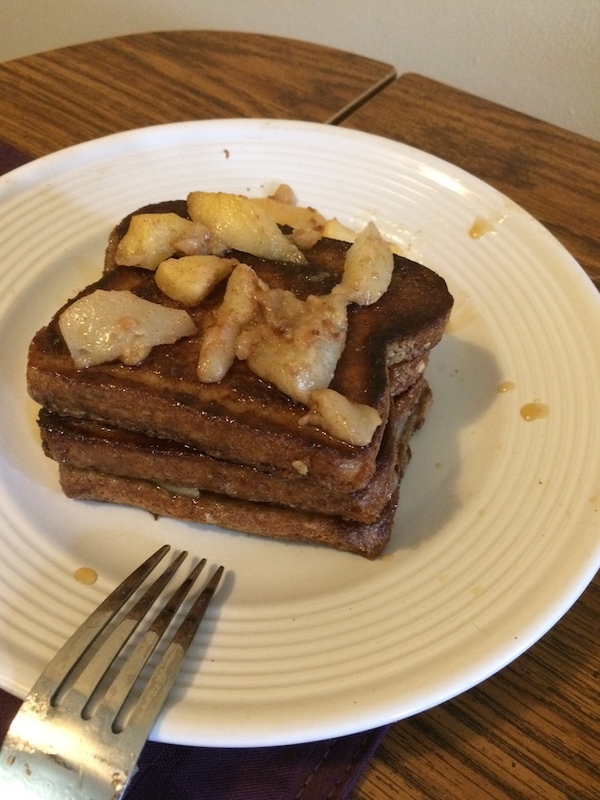 I “toasted” God with (gluten-free) French toast, layered with pumpkin spiced fried apples and pears – a twist on a favorite treat my great-grandmother often made. I toasted Him with my praise and worship, gratitude and adoration. His presence was strong upon me today and much-needed as I walk through the day, tired from weeks of work stress, whirlwind trips and not enough sleep. Thankfully, I learned where my strength ought to come from – the LORD – as he carries my yoke (burden) daily. I remember when I first heard that I didn’t have to carry the burden alone – what a life changing moment! I’d spent much of my life allowing false burdens to weigh me down, not understanding it wasn’t my purpose. On this great day of celebration, I am most grateful for being able to allow the blood of Jesus to wash away my past – both before Christ and after. I am continually amazed at how, if we simply ask, He will wipe all negative memories out of our minds and purify our thoughts so we aren’t looking backwards at our mistakes or hurts, and beating ourselves up. It pains my heart when I meet Christians who don’t understand this is possible. Instead, deciding to keep the albatross of their past – trauma, mistakes, etc., – around their neck, instead of remembering they are forgiven and cleansed. Forgetting that a life with Jesus means they can take their peace and move past it all for good! God has also worked a lot within me about my identity over the past few years and I’ve been deeply humbled through the not great experiences I’ve walked through during this season. 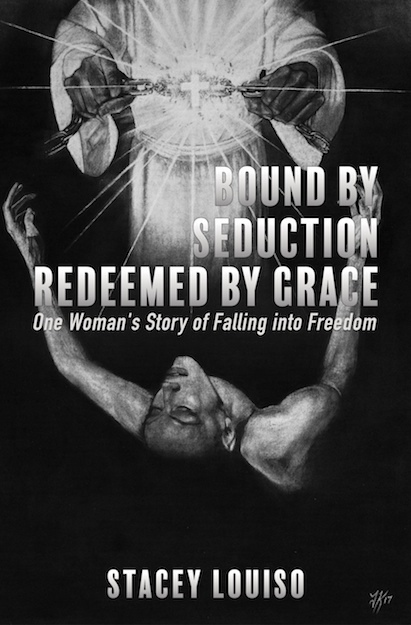 While welcoming the humbling, plus recognizing it as a way to be emptied out – this gave God the opportunity HE needed to perform such a deep work in my mind, heart and soul. Any pride that was buried inside me has been burned off like dross. Any desire to be known or elevated by man for anything I do, has been turned into an even deeper desire to give God the glory, in and through what I create, say and do. I have relinquished the person I thought I was into my Lord’s caring hands. God knew what he was going to do, long before I ever did. That is how wonderfully omniscient He is. By all of this, I am blessed beyond measure. So, today, I thanked God and I thanked my spiritual mom, who spent those ten years praying for me, and the friend He used to get my attention. I look forward to the year leading up to the ten-year anniversary (the number 10 in the Bible often signifies perfection or completeness). I have already seen a glimpse of what’s to come, and am entering into the coming season of life very prayerfully, carefully (not to get ahead of God or allow my free will to interfere) and open to how God moves. Father God, the only way I could possibly repay You for your amazing, saving grace is through complete submission and obedience to Your Word and how You move me through this life. To keep my eyes focused like flint on the LORD, and walking hand-in-hand with Him. By keeping a prayerful, grateful attitude (and repenting for the moments I am not exuding that) each day, for Your constant outpouring of provision, love and mercy upon my life. To continually relinquish my heart and my flesh to You; knowing that You know better than me what is best, what is to come and what I need. I praise you with my thoughts and voice for YOU alone are worthy of my time and worship. Thank you Jesus, for life more abundant and for bringing the people into my life who are meant to walk with me in love, not friction. I exalt you for your healing mercies that I desperately need, daily; and simply for being the LORD of my life. I pray this in the name of your precious Son, amen! Here is a great song for this occasion: “We Celebrate You” by Shannon Wexelburg. I truly appreciate your taking time to both read and comment in the post. May God be with you!